Are you unexpectedly expecting? Discovering an unplanned pregnancy can be a very overwhelming and emotional experience. Right now, you may be feeling scared, confused, embarrassed, panicked, or even in disbelief. It is important to know that these conflicting emotions are completely normal for newly expectant mothers. It is also important to know that you have the ability to turn that positive pregnancy test into a positive experience overall, even if you are not ready to become a parent. If you are facing an unexpected pregnancy and do not know what to do, you have come to the right place. Adoptions With Love is a non-profit, full-service adoption agency helping expectant mothers make the best possible choices for themselves and their children. We can also help you. This blog is designed to get you through your first trimester, outlining the most important steps expectant mothers should take in the first few months of an unplanned pregnancy. 1. Look for pregnancy symptoms. Are you feeling fatigued, gaining weight, or more nauseous than normal? Are your breasts tender of have they changed in size? Did you miss your last period and think you might be pregnant? These symptoms can be a good indicator that you are pregnant. However, it is important to confirm with a doctor. Other factors can cause signs that resemble pregnancy symptoms. For example, too much exercise or stress can cause a missed period. 2. Confirm your pregnancy with a trusted medical professional. If you are exhibiting signs of pregnancy, missed your period, and think you could be pregnant, it is important to see a clinical professional. Make an appointment with your primary care doctor or OB/GYN and request to schedule a pregnancy test. Even if your home test came back positive, you should still make a doctor’s appointment to confirm its results. Your doctor will be able to tell you how far along you are in your pregnancy, and how your baby is developing. (By the end of your third trimester, your baby is already about the size of a peach and has begun to develop eyes and ears, fingers and toes, as well as a heart, brain, and muscles.) Understanding how far along you are will determine your next steps for care. 3. Start taking good care of yourself. Pregnancy, without a doubt, requires some lifestyle changes. If you were not expecting to get pregnant, you might have unknowingly partaken in activities unhealthy for your baby up until this point – not getting enough sleep, drinking alcohol or using drugs, consuming a lot of caffeine, taking prescription medications, smoking, or consuming raw foods. After learning you are pregnant, you may have felt depressed or overly stressed. Now that you know you are pregnant, you can make positive changes in your life: start eating healthy, drinking water, limiting your caffeine intake, and cease any smoking or substance use (alcohol, drugs, tobacco). Start taking a prenatal vitamin with folic acid, which can help prevent health problems in your baby, and pursue ongoing prenatal care. If you are battling any negative feelings, see a counselor who specializes in unplanned pregnancy. The compassionate social workers at Adoptions With Love can also help you work through any complicated emotions. 4. Learn about your different pregnancy options. You have many unexpected pregnancy options as an expectant mother. If you know in your heart you are not ready to become a parent, your first trimester will be the time to decide if you would like to terminate your pregnancy or carry your child to term and make an adoption plan. By now, you may have already started to bond with the baby in your belly. You may be thinking that terminating your pregnancy is not an option at this point. If you are not ready to raise a child, know that adoption is a positive alternative. Adoption allows you to make a thoughtful plan for your baby, even when you were not planning to have him or her. Through adoption, you can choose a family for your baby and keep in touch with your child’s adoptive family years down the road. Ask your doctor for more information about adoption, or call Adoptions With Love to learn more about making an adoption plan. 5. Make a plan for your pregnancy. If you choose to continue your pregnancy, now is the time to start planning for what is ahead. Things to consider include where you will live, which doctor you will see for prenatal care, and how you will finance any medical or maternity expenses. Many insurance plans include some maternity assistance. If you do not have health insurance, however, your state may offer public assistance programs for pregnant women, such as food stamps or government-funded housing. If you choose to move forward with making an adoption plan, there will also be financial assistance available to you. Adoptions With Love, for example, offers housing assistance, legal services, and complete counseling at no cost to expectant mothers during and weeks after their pregnancy. If you do not have a doctor, we can help you find quality medical care. We can also cover any uninsured medical expenses after your adoption is complete. Your first trimester is the time to find the right resources, take care of your health, and begin making a plan. In the early stages of an unexpected pregnancy, knowing what to do can truly benefit your baby’s health and your feelings during this time. If you need adoption support or help at any point in your pregnancy – now or months from now – know that Adoptions With Love is here for you, and only one call away. Contact us toll-free at 800-722-7731 or text us confidentially at 617-777-0072 to get started. 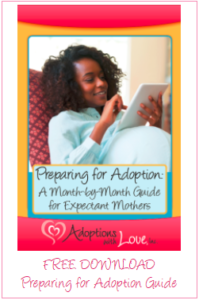 For more tips on what to do for an unexpected pregnancy, as well as help through each trimester, please download our month-by-month guide below.